As seen on the VOx entrepreneurial show "The Lion's Den", the KeDDii Litter Scoop allows for easy and hygienic cleaning of your cat's litter tray! It effectively removes any soiled litter from the tray, whilst clean litter simply falls back through the sieve and back into the tray. No longer will you have to throw away an entire tray of mostly clean litter! No matter whether you use fine or large grain litter, the KeDDii Litter Scoop is ideal, as the sieve size is adjustable between 0-12mm. The integrated rubber extractor allows for easy disposal of the litter. 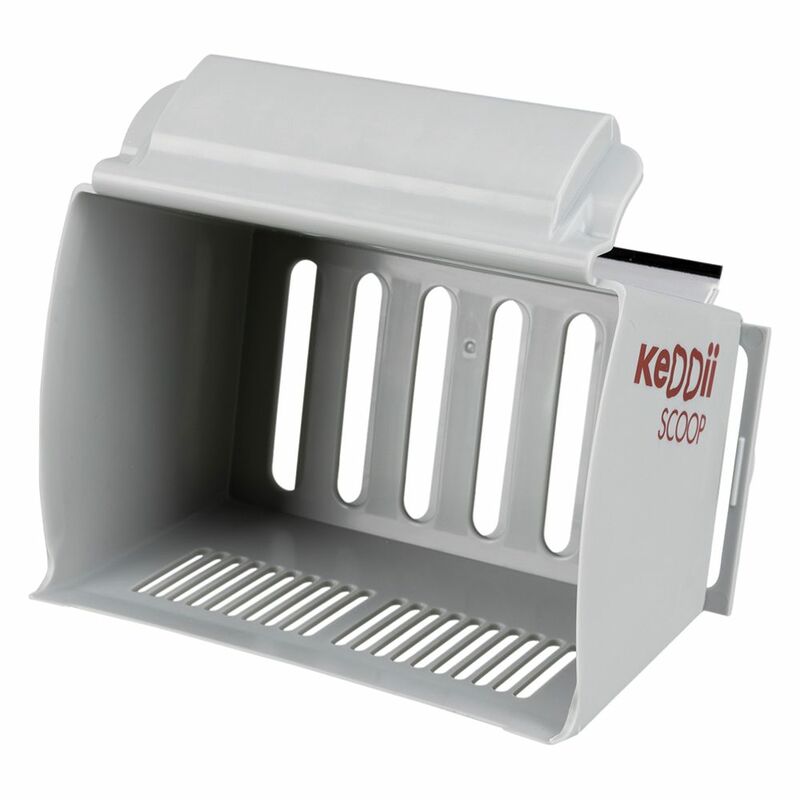 The KeDDii Litter Scoop can have its sieve closed completely, meaning it can also be used to fill your cat's tray with litter. The KeDDii Litter Scoop offers 6 fabulous products in 1 – sieve, scoop for filling, levelling, crushing, scooping out and sweeping. Cleaning your cat's litter tray has never been so easy and efficient! KeDDii Litter Scoop at a glance: Multifunctional litter scoop for effective cleaning of cat litter trays As seen on the VOx entrepreneurial show: "The Lion's Den" No wasting clean litter: sieve size can be manually adapted (0-12mm) Can be used for any desired cat litter: from fine to large grains Can save up to 30% cat litter Completely closable: so can be used for filling trays with fresh litter With integrated rubber extractor 6-in-1 scoop: Sieve: sieve openings can be fully adjusted Filling: easily picks up litter without unwanted dust Levelling: move soiled litter away from the sides and floor of the tray Crushing: the sharp edge can break up large chunks Scoop: can effectively scoop 10x more than a standard scoop Sweep: the rubber lip allows you to easily move fallen litter into the scoop Easy to use Colour: grey Dimensions: 17 x 11 x 16. 5 cm (L x W x H).